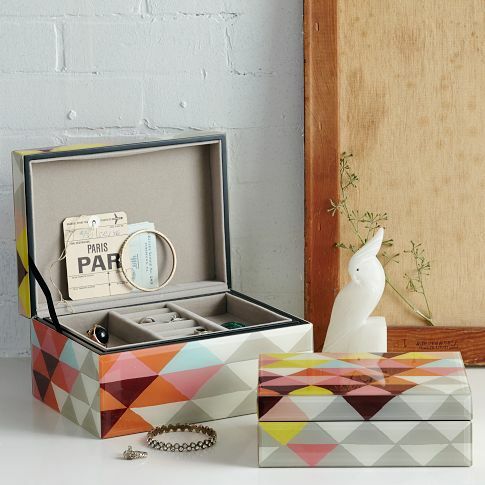 I fell in love with this mosaic patterned jewelry box from West Elm - the pattern, the colors…the whole thing is just awesome. My version cost about $11, which is definitely a much happier price than the original featured. 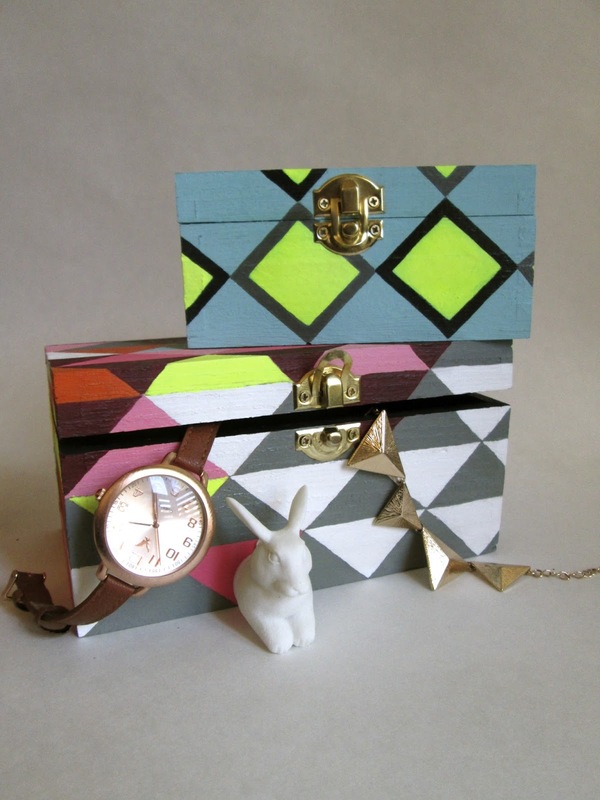 Plus, you can customize the pattern with absolutely any color, making a fun and totally "you" one-of-a-kind piece. Happy crafting! Plain Wood Box – I bought a two-pack at Michael’s. They have boxes with and without latches, and the choice is really based more on personal preference than anything else. Paint – I used the cheapest options available: Craft Smart acrylic paint in Pink, Grey, Neon Yellow, Robins Egg Blue, and White, and Americana acrylic paint in Spiced Pumpkin and Cranberry Wine. Precrafting Prep: If your box is rough, you may want to sand it first. My box ended up a little more uneven than I would’ve liked. Start by using your ruler to lightly pencil horizontal rows onto your box. Each row was the same width as the ruler. The rows should go up the front, across the top, and lastly around the sides. Note: There’s no way to have the design match up on all sides (even the original doesn’t). My pattern starts on the front and wraps up the lid and around the sides, so the front panel matches the top and sides, but the top and sides don’t match each other. Next draw your triangles within each row. The sides of my triangles are all 1 ½ inches, and the tops/bottoms are 2 something. It doesn’t really matter what the tops/bottoms come out to be as long as your sides are all the same. Now you can start painting! I followed the pattern on the original West Elm box as closely as possible, but you can do any number of fun patterns and color combinations. I may make another that is lavender, white, and gold. Keep in mind that you want your triangles close to perfect without actually being perfect. If you look at the original inspiration, you’ll see that those triangles aren’t perfect either – the imperfections give it character. Once your box is complete, you can treat it with the acrylic spray. It’s important to apply a VERY light layer – unevenness will be noticeable because the thicker areas will be shinier. If you want a really shiny finish, you’ll need to apply multiple thin layers with about 15 mins of drying time in-between. This last step is optional. After allowing the box to dry overnight, you can create little “feet” on the bottom to protect your wood furniture with a hot glue gun. Just make dime sized dots in each of the four corners. I also used left over paint on the second smaller box to create a cool diamond pattern, but there are so, so many cool ideas floating around in my head that I may just have to buy another box. 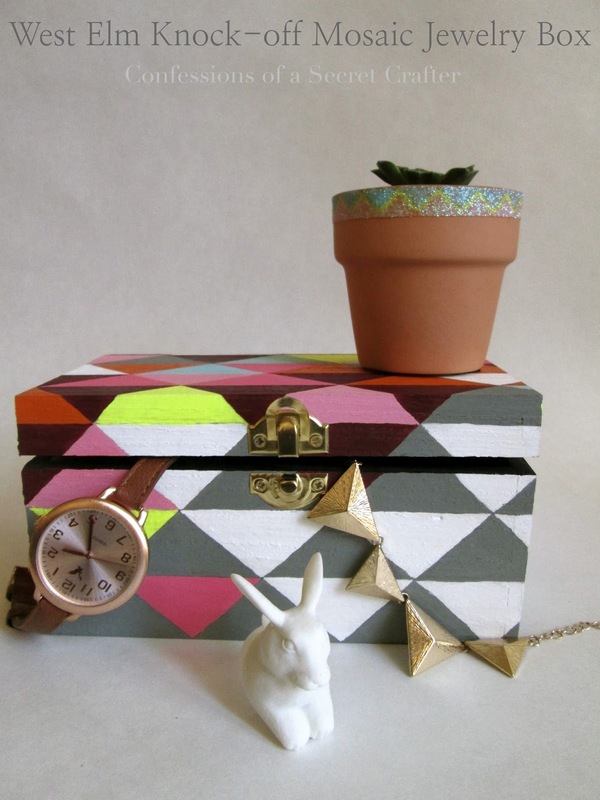 This project was featured on Flamingo Toes, Delineate Your Dwelling, and Becoming Martha. wow this looks absolutely beautiful. You have such a steady hand beautiful clean work. I'm totally pinning this. Thank you Anam! I'd like to say that it's talent, but in reality it's the result of lots and lots of practice. Thanks for pinning! Okay, this is totally gorgeous. Like I honestly am making a stop to the craft store to get supplies tomorrow. I LOVE it. Super cute! I want to make a few to organize crafty goodies in my office! I might even line mine with faux-velvet or another soft fabric. :) Thanks for the inspiration! Awesome post! I've been following you for a while, and this is one of my favorite blogs. Thanks for sharing!